Now that the Apple Watch is up for pre-order, a lot of us will have a decision to make – "Do I dole out a couple hundred on a smartwatch, or should I instead just get a normal, classic timepiece for that kind of dough?" It's only natural that you ask yourself if an investment in an Apple Watch is worth it, especially if you don't dig sporty watches. That's because the cheapest Apple Watch, at $349, comes with a fluoroelastomer band that reminds a lot of rubber, and doesn't go well with fancier outfits. Anything more premium (like leather or stainless steel), and you quickly get into the thousands of dollars. Admittedly, Apple is likely the only tech brand right now that can allow itself the audacity of asking for as much for a gadget that will likely become obsolete in a matter of two or three years. Given how the most expensive, 18-carat gold version of the Watch will run you the whopping $17,000, it's worth asking the question if you aren't better off with a Breitling or a Patek Phillipe that will likely last you decades and never go out of style. We picked a few of those, and across the price spectrum in order to match the Apple Watch's price points, and we have to say that unless you really want a smartwatch, you should definitely consider a classical timepiece. 11 years warranty, water resistant up to 165 feet, mechanical movement with hand-wind mechanism, made out of stainless steel. For approximately the price of the cheapest Apple Watch, you're getting a stainless steel watch body with a leather band, water resistance at up to 99 feet deep, and an anti-reflective sapphire glass cover. Embellished with 18K rose gold, sporting an anti-reflective sapphire glass cover, and offering water resistance at up to 168 feet, made out of stainless steel and leather. Made out of stainless steel and alligator leather, covered by synthetic sapphire, and water resistant up to 100 feet. Made out of stainless steel and leather, offering sapphire crystal protection with anti-reflective coating and water resistant up to 100 feet. Stainless steel plus synthetic leather and sapphire glass, water resistant up to 99 feet. Titanium case, ceramic bezels, calfskin leather for the band. Also protected by anti-reflective sapphire glass and water resistant up to 330 feet. 18K rose gold case and bezel, leather band, anti-reflective sapphire glass, resistant up to 100 feet. Extremely precise. 18K rose gold case and bezel, alligator leather band, anti-reflective sapphire cover, resistant to water up to 330 feet. This one costs a little more than even the fanciest of Apple Watch models, but it is a Patek Phillipe at the end of the day. Made with rose gold body, square-scaled alligator leather band, sapphire for the front and back. Mechanically-wound. Water resistant up to 100 feet. Instead of getting a $349 Apple Watch (the cheapest model possible), you can instead get 6 Cadence Winston watches and have change. 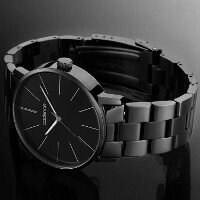 The Cadence Winston has IP black stainless steel case, back and bezel, along with IP black stainless steel band and clasp. Movement inside is of a Japanese make, and the watch is water resistant up to about 100 feet. You should've included a couple of Invicta Venom watches. Just watched a hands-on video for the Apple Watch, and man, Apple "borrowed" Android Lollipop's animations for that watch. I'd still go for conventional watches. I mean it's one of those accessories that you'll look good and not some nerdy geeky techie or whatever terminology. Plus, everyone of the 'dumb' watches will outlast any iWatch. There is a reason the U.S. Navy still uses sextants. The Cadence one looks like it inspired the Moto 360 design. Very nice. The First and the Last please. Wow these actually look more attractive than the apple watch. No matter people will still buy apples garbage. bought a griffin emblem watch with miyota movement with sapphire screen for only 250.
what about a ----CASIO G-SHOCK---- .....have a lot to offer for a nice watch.... anyone ??? Watches for adults. Children can get theirs from cereal boxes or the Apple Store. I highly recommend the Omega line - not quite the prestige or the markup of the Patek but mine is still perfect after two decades. They offer an elegant design between steel and gold for half the price of the Apple iGold - steel outer case with a gold inner case and steel bracelet links with gold connectors. A good watch is something you can give to your grandchild and it will still be functional. Apples, OTOH, rot. I agree my speedmaster is at least 15 yrs old and I still get compliments on it. What about rado and Citizen? Ummmmm......can they open my garage door? Pay for my goods? Turn on my lights? Control my car? send me text? Yea, you get the point. I'll take the Apple watch in stainless please. oh yes, I own plenty of dumb watches that I will keep in the rotation. Each watch has different purpose (and price). Your iWatch might turn on your lights when you're in Arctic but you don't even need to concern regarding the battery in your classic watch. ouchh.... u didnt mention Seiko? No seiko or casio g-shock I'm also dissappointed. Casio G-Shock atomic....130 bucks or less. Battery version will last 4-5 years, solar powered version will last 10+ years. Rugged, tells time. About all you need with a WATCH. Is this a troll article? None of those are smartwatches lol.. Gotta say I like the black fossil though. The title said Classic Watches. They are not intending to mention smartwatches. Learn to read before making extreme implications.